Gamal Eid does not restrain himself in his condemnation of Egypt’s Military Council. “The Military Council is even more brutal than Mubarak,” is his personal assessment of the transitional government run by the generals. He sees the policies of the Military Council under the leadership of General Hussein Tantawi as an attempt to prolong the system as it was under Mubarak and to ensure privileges for the army by any means available, despite the transformation going on in Egypt. The lawyer and head of the Arabic Network for Human Rights Information (ANHRI), an initiative founded in 2004, is the most severe critic of the military, which currently pulls all the strings in Egyptian politics. Only after the decisive conclusion to the presidential elections is the council prepared to hand over power to civilian authorities on 30 June. Whether they will actually do this and whether the transfer of power will occur trouble-free is currently the most gripping topic of conversation on the Nile. The main reason for Eid’s assessment of the situation is the sharp growth in the number of criminal proceeding in military courts. During the 30-year rule of Mubarak, some 1,200 cases were heard by military courts, while since the overthrow of the dictator on 11 February 2011 until January 2012, around 14,000 cases were assigned to military courts. The greatest share of these cases, however, were tried during the first months after the overthrow of the dictator and their number has decreased somewhat in recent months. It is true that the political prisoners from the Mubarak era were set free and no one is sent to prison without first being tried in court. However, the military reacts brutally against demonstrators, arrests them, and then construes spurious charges, such as the newly introduced offence of “reckless behaviour”. This offence was cited as grounds for arrest during a demonstration on 4 May in front of the Ministry of Defence in the Cairo district of Abbasiya, when 30 journalists were also taken into custody. According to a report by Human Rights Watch, there were more than 370 injured and 1 death on that day. Similar recent incidents have not been subject to due legal process, contrary to pronouncements by the military. “We are fighting against 60 years of an authoritarian state,” says Eid. This struggle will require a great deal of stamina. 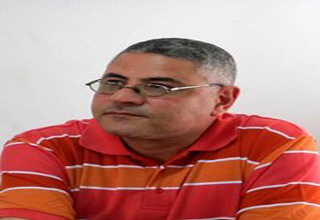 Gamal Eid, born in 1964, is a passionate lawyer. He comes from modest means and studied at the legal faculty of Ain Shams University in Cairo. He finds nothing better than to save the innocent from punishment. Under Mubarak, he was put in prison four times. As a founding member of the reformist Kifaya (Enough) movement, he was one of the secular pioneers of the Egyptian protest movement. Nonetheless, he also defended persecuted members of the Muslim Brotherhood under Mubarak. Eid was mistreated by a policeman, who has yet to be prosecuted for his actions. He is driven to continue with his work thanks to the possibility of finally being able to punish such deeds. In the eight years since its founding, the Arabic Network for Human Rights Information has developed into one of the most important NGOs for human rights in the Middle East. The Network has a staff of 25, including eight lawyers. It offers legal assistance for activists, promotes freedom of expression, and documents violations of human rights in the whole of the Arab world. Its website is one of the most frequently visited Internet sites in the Middle East on the topic of human rights. 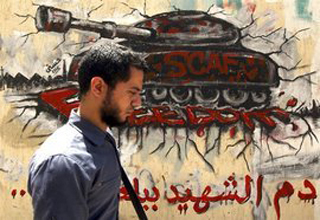 The bloody trail of the military: Graffiti in memory of the “martyrs” of the popular uprising against the Mubarak regime on 25 January Early this year, the Network published a document on the victims of the demonstrations on Tahrir Square. It includes the names of some 850 Egyptians, who died during the protests between January and February 2011 and also states the exact circumstances for their deaths as well as those responsible. It also investigates the question as to why the few court cases against military personnel involved in these events ended in acquittal. Since then, a judgement has been issued in one of the first cases against the police. In May, five police officers were sentenced by a judge in Cairo for their actions against demonstrators to ten years in prison. Ten other officers in the case were acquitted and two others were suspended from duty for one year. The question of prosecution of those who caused bodily harm to demonstrators is one of the most delicate political issues in Egypt. At the time of the incidents, security forces had fired directly into the crowd on Tahrir Square. Key concerns of the Military Council before it transfers power to civilian hands are ensuring immunity from criminal prosecution for officers and guaranties preserving their economic privileges. The media frequently report on such controversial issues. The document issued by the Network received a great deal of attention from independent newspapers, such as Al-Masry al-Youm and Al-Shourouk. Even Egyptian state television broadcast a report. Gamal Eid has been invited numerous times for interviews. The lawyer, who is renowned for his sharp tongue, only agrees when the discussion is broadcast live and thereby can’t be manipulated. “Revolutions aren’t led by polite people” is his motto. Media presence offers him a certain degree of protection, as does international recognition. In 2011, the Network was awarded with a 500,000 euro prize from the Roland Berger Foundation. The human rights activist therefore doesn’t let himself get agitated by the three court cases currently being pursued against him. 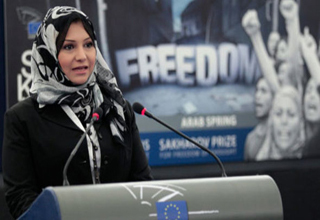 Among the prominent activists defended by Gamal Eid is the blogger Asmaa Mahfouz, recipient of the 2011 Sakharov Prise of the European Parliament. She was a member of the “April 6 Youth Movement” and one of the initiators of the protests on Tahrir Square. Since then, Mahfouz has consistently criticized the Military Council and leading politicians. A thorn in the eye of the military: Asmaa Mahfouz, the civil rights activist, recipient of the Sakharov Prize, and April 6 Youth Movement activist has frequently been critical of the army for abuse of power and human rights violations. In early May, she was sentenced in absentia to a year in prison and a fine of around 2500 Euros In early May, she was acquitted by a Cairo court of the charge of slander for her comments on Twitter. This was the first time in Egypt that an opinion posted on Twitter was the subject of a court case. Tarek Zidan, the Chairman of the Party of the Egyptian Revolution, had filed a suit against her. Mahfouz is burdened with still further court cases. She stands accused of hitting a man during a demonstration and was sentenced in absentia to a year in prison. The sentence was upheld on appeal. Such politically motivated lawsuits against bloggers, journalists, and demonstrators serve primarily to intimidate critics. If Egypt truly wants to move in the direction of democracy, then its police and justice system must be fundamentally restructured. Only in this way, can the rule of law one day prevail. “The Interior Minister must apologize for torture and murder,” demands Eid. But that is only the first step. The Interior Ministry and its bloated police and security apparatus with some 1.25 million officials must be fundamentally restructured and slimmed down. Every police officer should be identifiable by a name badge and a call centre for complaints must be set up, says Eid. All training candidates should at least be able to read and write. The selection procedure for the military academy should be transparent, so as not to favour the children of high-ranking officers. The activities and workings of the special forces and security services must finally be made open to the public. Despite his fundamental scepticism concerning the military, Eid nonetheless feels that the generals will eventually give up power. The Egyptian Military Council is not a Latin American junta. Its concern is to ensure its privileged position in Egyptian society, and then it will step to one side. There are frequently occurring rumours about an agreement between the military and the Muslim Brotherhood, which dominates parliament. The lawyer is convinced that “pressure from the street might be necessary”. The Network has already spoken out against the announced attempt by the Military Council to issue a constitutional declaration before the handover of power that would limit the powers of any future president. Despite all the difficulties, Gamal Eid is cautiously optimistic. He believes that Egypt could develop along the lines of Indonesia. In that country, Islamists took power after the end of the dictatorship. Citizens were soon disenchanted with the Islamists and developments towards democracy could then get underway.